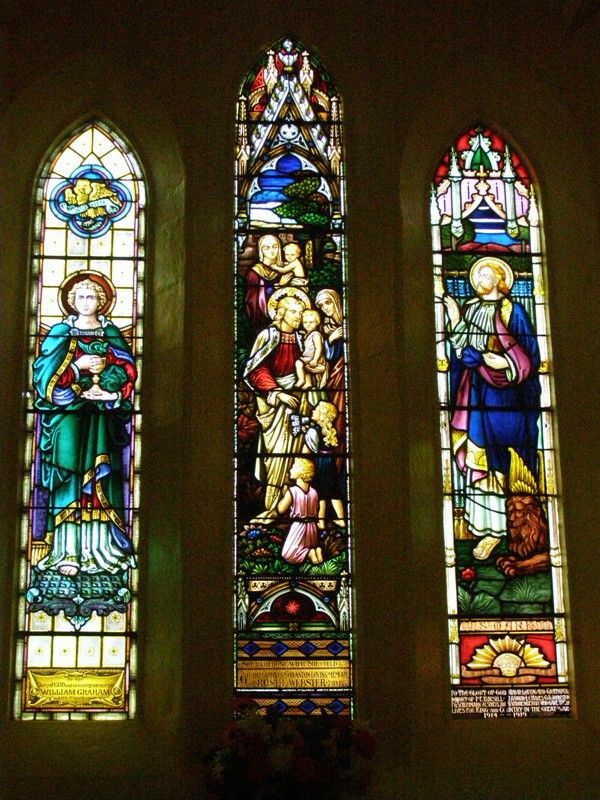 A window commemorates seven local men who died in service or were killed in action in World War One. The unveiling and dedication ceremony of the Soldiers Memorial Window was carried out on Sunday afternoon last, the church being well filled and the congregation including a very fair sprinkling of returned solders. The service, which commenced at 2-30 p.m., was conducted by the rector, Rev. J F Rofe, assisted by Rev D T Smith, who also carried out the unveiling and dedication ceremony, and preached a sermon most appropriate to the occasion from the text ' These are they who have come out of great tribulation.' 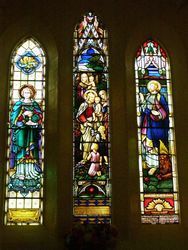 The preacher paid an eloquent tribute to the sacrifice made by the fallen men of Robertson, in whose memory the window is erected. The fact that they were volunteers made them the more honored. Only those who were there could realise what tribulation they passed through. In their short lives they accomplished more than most men who live the allotted span of three score and ten years. Very feeling words of comfort were tendered to relatives present. At the close of the service the 'Dead March in Saul' was played by Mrs Rofe, and the National Anthem sung by the congregation. The window is a very fine one, the cost amounting to £50, of which only £3 is still outstanding. 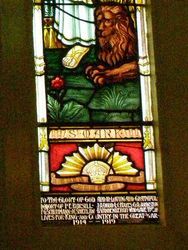 It bears a representation of St Mark and Lion, with the A.I F. Rising Sun at the bottom, together with the names of P E Bursill, J A Dodd, L C Hayes, G A Johnston, C G Schumann, J C Shierlaw, and B Vandenbergh, all of whom made the great sacrifice. The Southern Mail (Bowral, NSW), 2 July 1920.